When I started building this website I looked carefully at the latest research into EDS as I wanted the information on the site to be as accurate as possible. I read many medical papers, some of them very interesting, some rather dull, but there was only one paper that really stuck in my mind. The paper proposes a simple treatment for EDS which might prevent symptoms getting worse and could even improve them, and it isn’t based on stem cells or gene therapy or any such advances which might not bear fruit for many years. The idea is based on nutritional supplements, which are widely available without prescription. You probably have some in your home already. The paper is titled ‘A Novel Therapeutic Strategy for Ehlers-Danlos Syndrome based on Nutritional Supplements’. It was published in 2005, by Dr D. Mantle, Dr R.M. Wilkins and Professor V. Preedy. You can read the paper in full, for free, by clicking HERE. 1, Increasing scientific evidence that nutrition may be a major factor in the development of many disorders once thought to result from defective genes alone. 2, The recognition that many of the symptoms associated with Ehlers-Danlos Syndrome are also characteristic of nutritional deficiencies. 3, The combined effect within the body of appropriate nutritional supplements in promoting normal tissue function. The paper discusses the wide variety of essential nutrients which are required to maintain normal functioning of the body and how they are obtained. It mentions the poor nature of the modern diet and the depletion of nutrients in fruit and vegetables over the last 70 years. It gives examples of common EDS symptoms which are also well established characteristics of nutritional deficiencies, such as susceptibility to bruising and bleeding (ie. deficiency in vitamin C / vitamin K) and mitral valve prolapse (ie. deficiency of magnesium and coenzyme Q10). The paper mentions several reports of identical twins with connective tissue disorders with widely differing severity of symptoms, which the writers suggest indicates that disease progression can be influenced by environmental factors, the most likely of which is nutrition. The paper argues that the current RDA (recommended daily allowance) for many nutrients is too low and patients would benefit from much higher intake of some vitamins and minerals. The paper describes a number of precedents where the outcome of disease resulting from inherited disorders of metabolism can be improved by nutritional intervention. For example, folic acid supplements during pregnancy to prevent Spina Bifida. The paper suggests a number of supplements could be helpful for patients with EDS and suggests doses. The supplements suggested include: vitamin C for wound healing, Methyl Sulphonyl Methane (MSM) and silica for bone and collagen formation, Pycnogenol (an anti-oxidant) for bleeding, Glucosamine for joint pain, Carnitine for muscle weakness, Coenzyme Q10 for mitral valve prolapse, Calcium for osteoporosis and Linolenic acidis for pain and inflammation. In conclusion, the paper states that the combination of nutritional supplements they suggest are designed to counter the symptoms associated with EDS, namely skin and vascular problems, musculo-skeletal problems, cardiac mitral valve prolapse and periodontal disease. The paper is interesting and persuasive, but could an effective treatment for EDS really be as simple as nutritional supplementation? I was very intrigued by the paper, so I started taking it to hospital clinic appointments to ask my doctors view of the idea. I was expecting a negative possibly even dismissive response, but every doctor I showed the paper to responded positively. I can’t give his name online but one doctor described Professor Victor Preedy, one of the writers of the paper, as ‘Very well known and respected’. So I decided to write to Professor Preedy and his co-authors. I was very interested to know if the nutrition supplement strategy had ever been clinically tested, and what the outcome was. “The next issue is whether nutritional supplementation at high levels might benefit symptoms caused by the underlying EDS, as opposed to dietary deficiency as above. For example, the recommended daily intake of vitamin C to prevent dietary deficiency is 60mg per day, whether vitamin C intake at higher doses (e.g. 750mg per day) may boost collagen production in EDS is open to question. There have been no documented clinical trials to date, but there have been a few case reports that high dose vitamin C can improve the clinical status of patients with impaired lysyl hydroxylase activity.” (ref) (ref) (ref) (ref). I have also sent the nutritional supplements paper to several doctors considered to be specialists in EDS to ask their view of the idea. To date I have only received one reply. I can’t give the doctors name online, but he/she described the paper as ‘Interesting, but untested’. No clinical research study has ever been performed to assess the possible benefits of nutritional supplements for people with EDS (ref). The Ehlers-Danlos National Foundation, the largest EDS charity, recommend EDS patients take 2-4 grams of vitamin C per day. They comment ‘We find that ascorbic acid (vitamin C) is a big help with the bruising and in many cases, has improved wound healing and muscular strength. Recently, we have learned in the laboratory, that Vitamin C instructs the body to make collagen.’ (ref). EDNF also gives advice about the importance of magnesium via their Professional Advisory Network (ref). So EDNF agree, at least in part, with the strategy in the paper, ie. that nutrition supplements could be beneficial. An article by Dr Nigel Burrows on the Ehlers-Danlos Support UK website discusses the use of vitamin C, but stops short of recommending it due to the lack of scientific testing (ref). There is cutting edge research being done into treatments for Ehlers-Danlos Syndrome, but the simple idea of nutritional supplements appears to have been largely overlooked. This seems to be a shame. Nutritional supplements are widely available, relatively inexpensive and well tolerated. There are persuasive arguments they could be of real benefit to people with EDS, but we have no clinically obtained data to base decisions on. My aim in writing this article is not to encourage everyone with EDS to start taking numerous supplements every day. Instead I want to draw attention to this simple idea and hopefully encourage someone or some organisation to clinically assess the strategy. I will be sending copies of this article to EDS charities, relevant doctors and hospitals. I will update this article with any progress! Please remember I am not a doctor. I sent this article to Professor Qasim Aziz, a neurogastroenterologist at The Royal London Hospital. He told me he’d observed many of his patients improve after making certain dietary changes. He wanted to do a clinical research study into the benefits of nutrition on EDS, but lacked the funding. I challenged my father to raise the money and we formed a fundraising group with EDS UK and The Ehlers-Danlos Society. We recently launched the 12-24 film. You can read more about our project by clicking HERE. Since I wrote this article the US based charity EDNF has become The Ehlers-Danlos Society. They have a new website and two articles I linked to above are no longer online. However, they now feature a very helpful article about the benefits of magnesium for people with EDS by Dr Heidi Collins (ref). The charity EDS UK also recently launched a new website and an article I linked to above is no longer online. However they now give some general healthy eating advice and mention the use of supplements in an article by Jenny Morrison, a neurogenetics research nurse, about managing fatigue (ref). At the 2017 EDS UK / HMSA conference Lisa Jamieson gave a fascinating talk titled ‘Why Nutrition is Important’, which you can view HERE. Thank you for this Ceri it is very helpful. For us avoiding wheat and gluten and giving up bananas really made a huge difference. We have been advised also to top up Vitamin D by a variety of doctors A pediatrician, a rheumatologists and a cardiologist. Thanks for your comment. This was a frustrating topic to research. We seem to be many years away from a medicinal treatment for EDS. That leaves nutrition and exercise as our only avenues for improvement, but so little research has been done into nutrition. It’s not just what supplements may help, but as you’ve found there’s some foods that many of us with EDS benefit from avoiding. Professor Aziz’s gastroenterology research group has released a survey for patients and their relatives to identify the areas most requiring research in EDS. You can find the survey by clicking HERE. I know this was ages ago, but why give up bananas? Well, very good piece of research, Ces. It feels important for you (and all of us) to keep pushing until some real trials are done. This may have been “hiding in plain sight”, it seems. The simplest answers are always hardest to spot. Thank you. I worked on that post for over a year! Most of the time was taken up waiting and hoping for replies from letters. Thankfully I found Dr Mantle who was extremely helpful. – I’ll keep pushing the idea as it could potentially help many of us with EDS. I’ve been taking vitamin c for years after the doc who diagnosed me suggested it. Good to know it wasn’t a waste of time and lots of money!!! Most of the research I found about EDS and nutrition related to vitamin C. I hope more research will be done, but there’s enough evidence for EDNF to recommend its use. – I hope it’s helping you! I have EDS and just had a recent 2nd dislocation after hip replacement. I’ve been reading Michael Pollin for years, about inflammation theory, and for unrelated, I’ve been thinking about supplements, and found this article. Fantastic, this seals the deal for me to try the addition of supplements. I also wonder about turmeric for general inflammation. Thanks for your comment. It’s good to hear you found this article helpful. You might also find some EDS & nutrition articles / videos by Dr Heidi Collins interesting. I’m hopeful research into how nutrition effects collagen development will one day lead to evidence based dietary advice that could help all of us with EDS. I’m sorry to hear about your hip problems, but really good luck trying nutrition supplements. Do you think that 1,000 of Vit C and Collagen would work for EDS? or is it a waste to buy the collagen? Vitamin C is a good idea. EDNF (now known as The Ehlers-Danlos Society) recommend 2-4 grams per day. However there’s no evidence to support the use of collagen tablets. EDS is caused by a genetic flaw in how the human body makes collagen. Swallowing collagen tablets (which are usually made of dried cow cartilage) won’t alter that problem in any way. So perhaps don’t waste your money on them. Dr Heidi Collins has published some articles and videos on nutrition and EDS which you may find helpful. Hi from Australia – this is really interesting. My husband had endoscopic repair of an aneurysm who ch has caused an aortic dissection of the infrarenal aorta. Surgeon is reluctant to operate again as it seems he may have eds or something similar. So beautiful my passionate about nutrition I have researched this and now have him on high Vit c, magnesium, lysine, picnogenal , co q 10, Vit E etc but interestingly copper deficiency may be a key factor in aneurysms . It seems to be all about bioavailable copper which is related to Magnesium and iron. So he’s now taking copper gluconate but at a different time to Vit c as they antagonise each other. I would love to put this out there for discussion and maybe ask dr mantle? Thanks for your comment. Sorry to hear about your husbands health problems. I’m a strong believer in the benefits of improved nutrition on many health issues. But I know nothing at all about aneurysms, or if nutritional changes may help them, sorry. You say ‘he may have EDS or something similar’. I understand there is an association between aneurysms and various connective tissue disorders so it sounds as though it would be very helpful for your husband to be assessed by an expert in the field and get an accurate diagnosis. In particular people with Vascular EDS have to be monitored very carefully. The diagnostic criteria for EDS have been changed recently. An experienced rheumatologist is needed to diagnose the condition, but there’s excellent advice and an explanation of the new diagnostic criteria on The Ehlers-Danlos Society Website ( https://ehlers-danlos.com/ ). You may be able to contact Dr Mantle through Pharma Nord UK. Good luck and I hope your husband is recovering well after his surgery. This article is great Ceri. So informative and pivotal to so many possible improvements for so many people! So well written too. Loved it. Thank you! – I just found your comment, sorry. I’m behind with my blog. – This article gets more hits than any other I’ve written by far, so it’s a subject a lot of people with EDS are interested in. Plus, as you know, it’s led to me being involved with something great (but I can’t mention that online for a while… 😀). I had pondered this 2 years. I take these With the Blood test first to verify the deficiency. I have osteoporosis also. And track the vitamin D to assure it is being released. Also a. Blood test. I have a Bio identical hormone And Major Neutritionist. In Greendale Wi. I am only a month and a half into it taking these supplements. I was hoping others sought out the benefits as well. Glad to see the interest in it. Thanks for your comment. I get a lot of interest in this article as many people with EDS are looking for something which might help. Hopefully there will be a clinical research study done into the benefits of vitamin supplements for people with EDS soon, so we have facts to base treatment decisions on. Good luck with your supplement programme, I hope it helps you. resolved altogether. Residual symptoms ameloriated by carbidopa/levadopa include gait issues, tremors, myofascitis, hypertonicity, spasticity, rigidity and stiffness following inactivity. treatment plan. Again, any deviation and the symptoms do return. Although my joints are still hypermobile and sublux, the laxity has improved, the chronic pain is gone and I have not had a dislocation in nearly a year. Thanks for your message. Sorry to take so long to put it online and get back to you. I was taking a break from writing my blog to concentrate on another EDS project… a film which raises money for EDS and nutrition research! It’s a topic you’re clearly passionate about so hopefully you’ll agree it’s a worthwhile project. The film is available on this blog now, and on the websites of EDS UK and The Ehlers-Danlos Society. I had a look at the website you mentioned, which I found very interesting. Is it your own website? Unfortunately much of it exceeds my medical knowledge, so I can’t comment, sorry. But it’s really great you’ve found a diet that helps you and you’re trying to spread word of your progress. You were diagnosed with BH4 deficiency and MTHFR polymorphisms along EDS? Sorry to be so slow replying, busy week. No, I haven’t been diagnosed with either of those conditions. I’ve been planning to do some research into MTHFR polymorphisms since the first message in this string, but I’ve been so busy with fundraising for research into nutrition and EDS I haven’t had time, sorry. I’ll get to it eventually! Thank you so much for following this up. I read it on chronicpainpartners website and there are lots of comments which seem to suggest people think it is a recommended regimen, rather than a proposal. I will see if I can link to your wonderful follow up there. Is your father still raising funds? Thanks for your message. My father and I are still fundraising, along with EDS UK and The Ehlers-Danlos Society. The research hasn’t started yet, so nutrition as a management tool for hEDS is still unproven. However Professor Qasim Aziz has observed many of his hEDS patients improve after making dietary changes, so we’re very optimistic nutrition could help improve the quality of life of the millions of people struggling with hEDS. – Thanks for linking to my article. Found you when searching for supplements, nutritional building blogs to support the formation of collagen. 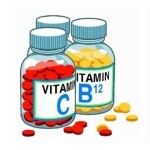 No doubt vit C in relatively high doses can support collagen production alongside key amino acids. Searching the net I find different information in relation to which amino acids are key to help form collagen. Diet-wise would bone broth be beneficial ? Thanks for your message. I’m passionate about the benefits of nutrition on EDS. I think it’s likely to become a key management tool for people with hEDS and HSD, alongside exercise. Although there’s many anecdotal stories of people with hEDS improving after dietary changes, unfortunately there’s little clinically obtained data on the subject. So I cannot give you any advice on what food and supplements may help you, sorry. Plus I’m not qualified to give any medical or nutrition advice. I can fully relate to the problems of how to consume many supplements each day. Personally I find drops easiest to consume, but you have to search to find many supplements in that form. Feel free to email me. I’ll put my address below temporarily. If you would like to see research done into nutrition and EDS you could donate to the 12-24 campaign. Plus you could vote in the Charity Film Awards (see my latest post!). Hi, I am so glad I found your site, I had read the NCBI introduction about nutrition, but could not get the full text, I clicked on your link but am not a professional researcher, how do I access it please? I researched all the authors a few weeks ago and drafted an e-mail enquiry about dosage to them but it looks like you are already on it! Waiting for EDS and POTS diagnosis, I have been told I ‘almost certainly’ have them – loads of symptoms. I have successfully used diet and nutrition for other issues including MS in the past. It is all fascinating. The site I linked to used to let you download the paper easily. You now have to click on ‘Request Full Text’ and give them your details. Try that, if it doesn’t work email me. I wrote to all three authors of the paper and heard back from two, who were both very helpful. Their responses are in my article. If you are seeking further information about nutrition and EDS try watching Lisa Jamieson’s EDS UK conference presentation ( click here ). We’ve been fundraising for nutrition research for some time and are hopeful the first phase of the research will start in the next few months. Good luck seeking a diagnosis. I’m glad I found your site too! I was diagnosed with EDS 3 years ago at 59 after 18 years of chronic pain and doctor hopping. The doctor that said I probably had EDS told me to figure it out online. I’m one that even stands out with EDS people because my symptoms don’t show outwardly. I used to be very flexible when I was little but after years of chronic pain my muscles have gotten tighter. I gave up trying to get help & use natural things to control the pain. But unfortunately it isn’t controlled. I hope someone figures it out for us. I spent so much money that we’re still paying on it. Thanks for caring! I hope I can learn some more from you! Thanks for your kind message. I’m glad you found my site helpful. Sorry it took so long for you to be diagnosed and your pain still isn’t controlled. I believe and hope that we are making progress. Diagnosis times are reducing and awareness of EDS is increasing, even if the progress is slow. Personally I’m optimistic about the EDS and nutrition research that we’ve been fundraising for. Hopefully the studies will demonstrate nutrition can be an effective management tool for hEDS. Keep following my blog for updates on the project.